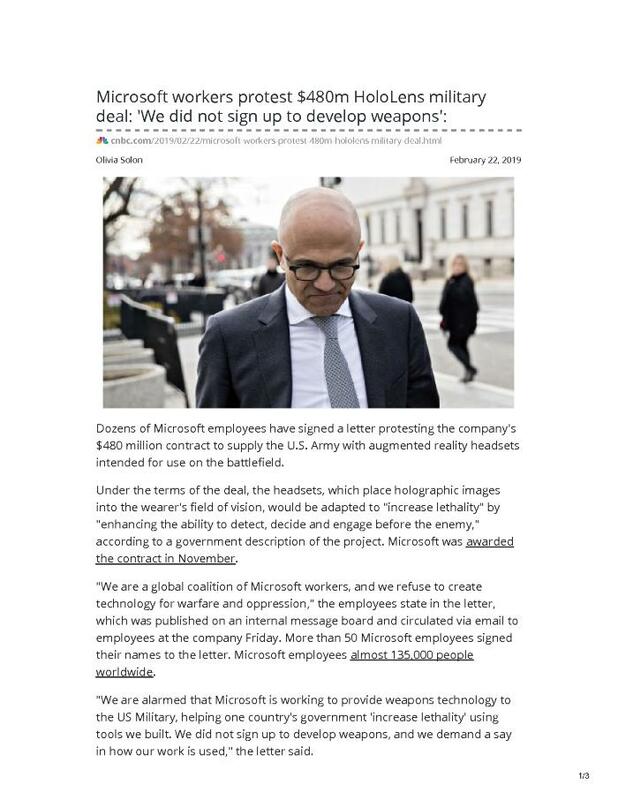 Dozens of Microsoft employees have signed a letter protesting the company's $480 million contract to supply the U.S. Army with augmented reality headsets intended for use on the battlefield. Under the terms of the deal, the headsets, which place holographic images into the wearer's field of vision, would be adapted to "increase lethality" by "enhancing the ability to detect, decide and engage before the enemy," according to a government description of the project. Microsoft was awarded the contract in November. "We are a global coalition of Microsoft workers, and we refuse to create technology for warfare and oppression," the employees state in the letter, which was published on an internal message board and circulated via email to employees at the company Friday. More than 50 Microsoft employees signed their names to the letter. Microsoft employees almost 135,000 people worldwide.